Will my customers be notified of a missed call? Yes, they will receive a customizable SMS after a missed call. 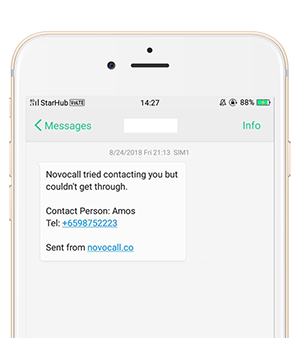 When Novocall connects your call rep with your customers but was unsuccessful, your customer will receive an SMS regarding the missed call. Customer requested callback, none of your company's call reps answered. You may change the test message of successful and missed call via our SMS Configuration. You may access it via "Settings" > "Call Settings" > "SMS Configuration"
Important: There are 3 placeholders - Call Rep Name, Call Rep Number, Company to add in your SMS. We'd recommend adding them in your customized SMS to make your contact more personalized.